To deliver nonstop monitoring of acetonitrile (ACN): water mobile phase gradients used in prep scale reverse phase chromatographic separation of active pharmaceutical ingredients with a ClearView db fiber optic filter photometer. The NIR spectra of ACN:water mixtures was measured using a spectrophotometer to choose wavelengths for Guided Wave’s process photometer. Two meters of low-OH fiber optic cables were utilized and the measurement of the samples took place in a 10 mm quartz cuvette at 40 and 50 °C. Figure 1 shows the resulting spectra for 10, 20, 30, 40 and 50 wt. % water in ACN. The primary water peak close to 1,420 nm is off-scale for the 10 mm optical path chosen. The other option would be to use a 1 or 2 mm optical path to maintain this peak on scale. The faintly different curves at each concentration reveal the effect of sample temperature on the water spectrum. Two wavelengths were chosen for calibration. The calibration model also comprises a coefficient for sample temperature. Figure 2 shows the predicted vs. actual plot and illustrates an outstanding calibration with an R2 of 0.9997 and a standard error of 0.3% water. A correction of 0.15% water/°C is indicated by the temperature coefficient. The ClearView db’s long-term drift of less than 500 µAU therefore provides outstanding precision. 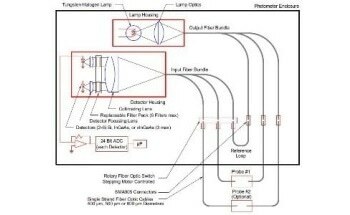 Guided Wave’s low cost ClearView db photometer is capable of readily making this measurement by utilizing direct insertion fiber optic proves or flow cells for bypass streams. Guided Wave’s ClearView db photometer is capable of measuring two independent fiber optic probes simultaneously, thus minimizing the overall price per sample point.